Gary Martin Allenson (born February 4, 1955) is an American minor league baseball manager and a former Major League catcher and coach. Formerly a manager of the Triple-A Buffalo Bisons of the International League, he has been a member of the Toronto Blue Jays organization since January 7, 2013. Nicknamed "Muggsy," Allenson was born in Culver City, California, and graduated from nearby Lawndale High School. He played college baseball for the Arizona State Sun Devils, then was selected by the Boston Red Sox in the ninth round of the 1976 amateur draft. During his rookie 1979 season in the Majors, Allenson was the Red Sox' most-used starting catcher, filling in for injured veteran and future Baseball Hall of Famer Carlton Fisk. For the remainder of his playing tenure (1979–85) in the Major Leagues, however, he was a backup for the Red Sox (through 1984) and Blue Jays (1985). The 5 ft 11 in (1.80 m), 185 lb (84 kg) Allenson batted and threw right-handed. In a seven-season MLB career, he posted a .221 batting average with 235 hits, 19 home runs and 131 RBI in 416 games played. Allenson began his minor league managerial career in 1987 with the Oneonta Yankees of the New York Yankees farm system. Compiling an 89–62 record in two years, he led the team to the New York – Penn League championship in 1988. He returned to the Red Sox organization in 1989, first managing at Lynchburg for two seasons (128–146) and then New Britain for one (47–93). He was promoted to Boston, serving as bullpen coach in 1992 and 1993 and third-base coach in 1994. He returned to the minors in 1996, managing the Charleston RiverDogs, then a Texas Rangers affiliate, to a 63–78 record. He moved on to the Houston Astros farm system the following year to pilot the Jackson Generals to a 66–73 mark. He spent the next five campaigns in the Milwaukee Brewers organization, the first two leading Louisville, known as the Redbirds in 1998 and the RiverBats in 1999, to a combined 140–148. He was brought up to Milwaukee, where he was the first-base coach in 2000 and the third-base coach in 2001 and 2002. A 77–57 campaign in 2005 at the helm of the Carolina Mudcats, then a Florida Marlins affiliate, was sandwiched in between two stints in the Baltimore Orioles organization. He piloted the Ottawa Lynx to a 79–65 finish in 2003. 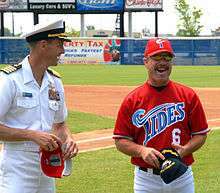 After a 31–37 year as skipper of the Bluefield Orioles in 2006, he returned to the International League to manage the Norfolk Tides to a combined 228–254 in a little over 3⅓ seasons. Allenson was promoted to Baltimore as its third-base coach on June 4, 2010, when Juan Samuel was promoted to interim manager upon the firing of Dave Trembley. Allenson returned to manage the Tides in 2011 then was the 2012 manager of the Aberdeen IronBirds, the Orioles' Short Season-Class A affiliate. Allenson rejoined the Toronto organization in 2013 as manager of the New Hampshire Fisher Cats, the Jays' Double-A Eastern League affiliate in Manchester, New Hampshire. After leading the Fisher Cats to a 68–72 mark that season, he was promoted to Buffalo, where his club went 77–66 (2014) and 68–76 (2015) in his first two seasons. He was reappointed manager of the Bisons on January 19, 2016. Though 2015, Allenson had compiled a 1,245–1,362 (.478) record over 21 seasons as a minor league manager. ↑ Davidi, Shi (January 13, 2014). "Blue Jays unveil minor league coaching staff". Sportsnet. Retrieved January 13, 2014. 1 2 "Blue Jays announce Minor League appointments". MLB.com. January 7, 2013. Retrieved February 10, 2013. 1 2 3 Gary Allenson (managing & coaching history) – The Baseball Cube. ↑ Zrebiec, Jeff (June 4, 2010). "Orioles fire manager Dave Trembley: Samuel to take over club on interim basis". The Baltimore Sun. Retrieved June 4, 2010. ↑ "Tides sign Portsmouth native and a new manager". The Virginian-Pilot. November 24, 2010. Retrieved November 24, 2010. 1 2 "Allenson returns as Bisons' skipper". milb.com. January 19, 2016. Retrieved 2016-01-23.